The A-List Diet turns one! Join the celebration with the best gift you can give yourself. When I created the A-List Diet, I knew it would be different from all of the others… Something people could stick to—effortlessly—for life. I’m thrilled to announce that beginning this month, The A-List Diet will officially be available in paperback! So whether you’re enjoying some pool-side reading this summer, cooking up one of my 100-plus delicious A-List recipes in your kitchen, or dining out at the new restaurant in town… you’ll never be left guessing what to eat in order to meet your weight loss goals. With the A-List Diet, you’ll transform your health, your energy, and vitality—from the inside out. And best of all, you’ll finally know what it’s like to truly feel amazing in the skin you’re in. 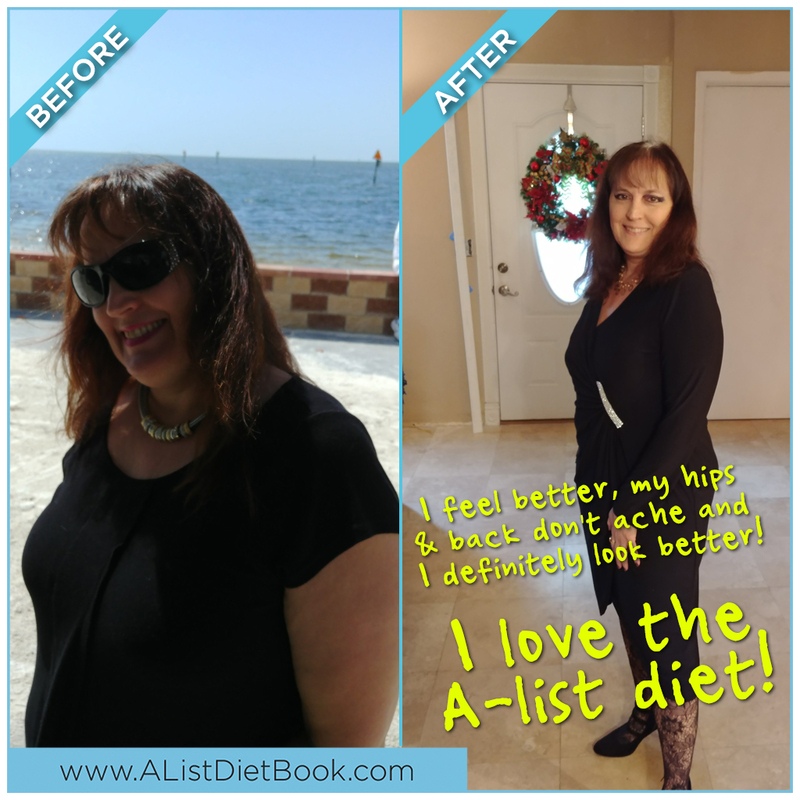 Lisa G. began her A-List Diet journey in May 2017. At the time, she weighed 208 pounds, could hardly zip up her size 20 jeans, and suffered from nagging hip pain. Lisa came across my article last year in Woman’s World, detailing my discovery of how branched-chain amino acids (BCAAs)—a major basis of my A-List Diet—can impact long-term weight loss. (Funny enough, Woman’s World featured me on their cover again last month! And I recently found out last year’s article—the one where Lisa first heard about the A-List—was one of the top-selling cover stories of 2017.) She was intrigued to say the least—it was like nothing she’d ever seen from the other diets that failed her in the past. Lisa owns several businesses alongside her husband in Florida. The daily stressors and on-the-go meals weren’t doing any favors for her waistline. So she decided to give The A-List a try. Five months later, Lisa was ecstatic when she slipped into a size 14 jean for the first time in years. And now, after losing a whopping 42 pounds, she’s only 15 pounds away from her goal weight—and couldn’t be happier. She shared with us that her friends and family often ask how long she’ll diet for, but explains how the A-List has easily become a lifestyle—one that is attainable, convenient, and most importantly, enjoyable! It’s only a matter of time before YOU have a similar story to share. I can’t wait to hear all about it! All you have to do is head over to the A-List website (www.alistdietbook.com) to pick up your copy today—now in hardcover AND paperback. You can also find The A-List Diet in major book retailers as well as on Amazon.com.